We have promoted the Secret Betting Club in the past because they can be trusted and are a good barrier between punters and dodgy tipsters. They can help you avoid bad tipsters and point you in the direction of the good ones. This summer they have launched a football compendium. They aim to help readers make the most of their tipping this year and they are well worth looking into. They rank their top 25 tipsters so you can see who are the ones to follow and who to avoid. There is also a video, shown below, that explains more about it. 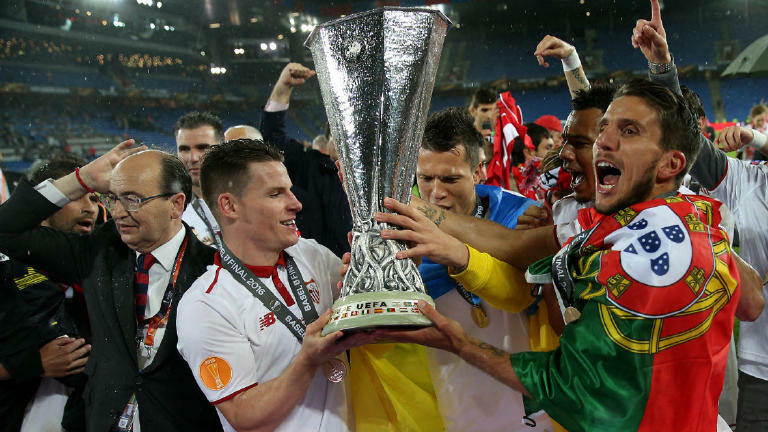 Sevilla win! An 8pt profit on the tournament. Won last year with Sevilla and again this year. Villarreal made the semis as well and until someone topples the Spanish clubs they really are too big price wise for this. Dortmund were such a strong favourite it didn’t make sense. More again on this next year. Secret Betting Club members are now absorbing the feast of statistics contained in their latest Tipster Profit Report – featuring all you need on finding tipsters to make you money betting. In this latest report they reveal the very latest profit figures from the 59 tipsters that they proof. Their easy to follow tables and editorial recommendations make it simple for you to find out not only who the best tipsters are, but who the right tipster is for you! How To Make The Biggest Bang For Your Betting Buck. 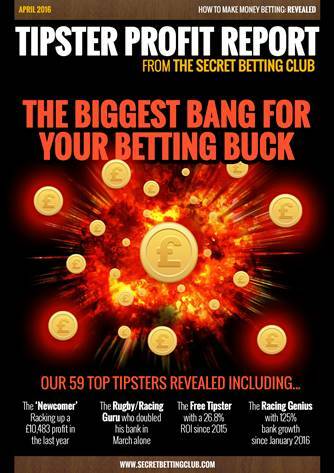 59 Top Tipsters Revealed Including…. • The Newcomer Racking up a phenomenal £10,483 Profit in the last 12 months. • The Rugby/Racing Guru who has doubled his bank in March 2016 alone! • The Free Tipster with a 26.8% ROI since 2015 & newly upgraded into their Hall of Fame. To help with this they breakdown the 59 tipsters into a whole series of categories so you can easily compare and contrast them. > Detailed Ratings On Every Tipster: Each of the 59 tipsters they track has its own designated Key Facts Page with 10 different ratings on everything from cost to customer service and profitability. > Massive Tipster Discounts: You can save £££’s on the cost of joining many popular tipsters through the special deals they negotiate on their member’s behalf. These are exclusive to the Secret Betting Club. > Back Catalogue Access: As 2016 is their tenth year of service, you can access their entire back catalogue of past reports and tipster reviews. 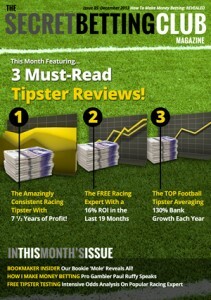 If they haven’t reviewed a tipster, it probably isn’t worth knowing about! So when they say a tipster is good it is because it genuinely is and not because they will make money by saying so. You can pick up your copy of this report, the instant you join the service at the Secret Betting Club with full access to their exclusive members-only area. Not only this but as an SBC member you can also gain full access to their monthly Betting Magazines, Practical Punter Reports & enjoy the peace of mind of their Money Back Guarantee if not satisfied once joining! I get a lot of promotional stuff from the Secret Betting Club (SBC) as I am an affiliate and I am doing a quick push now on them. I’ll be honest and say that if anyone signs up then I earn a commission. This is the reverse to how the SBC do things and is why they are such a good source for betting info. They review tipsters and proof them and can make recommendations on what tipsters to follow and those to avoid. When they recommend a tipster and someone joins that tipster SBC get no commission at all. They charge you a membership fee instead of just £79 for a year and so do not have to push products and can provide impartial advice. I have done work for the guys at SBC on their website and server and know that they are hardworking and honest, which counts for a lot in the betting field. I have include below their latest promotions. 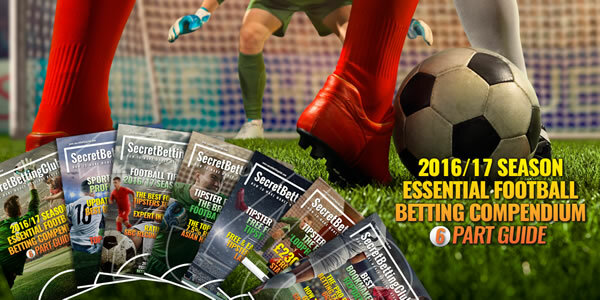 The very latest Secret Betting Club magazine (Issue 85) is out now and is an absolute must-read for those of you keen to find more on what makes money betting. The amazingly consistent Racing Tipster with 7 1/2 years of profit behind him! The FREE Racing Expert with a 16% ROI in the last 19 months backing big price each way bets. The TOP Football Tipster service averaging 130% bank growth per year since 2009! Insider Interview: Bookie ‘mole’ reveals all in an exclusive Q and A with currently employed odds compiler. How I Make Money Betting: Paul Ruffy talks about the secrets behind his 8 years of punting and tipping success. Tipster Testing: Intensive odds analysis reveals if one popular free racing expert is really worth following. You can pick up your copy of the latest magazine, the instant you join the Secret Betting Club. That’s not all though because as an SBC member you will also gain access to their huge 7 1/2 year back catalogue full of tipster reviews, expert interviews and guides, betting systems and profitable betting advice. The great news is that all of this is available for the equivalent of just 22p per day and comes with a full money back guarantee if not in any way satisfied once you joined. They are that confident you will love this service! This effectively means you have nothing to lose and everything to gain from taking up an SBC membership today. Sign-up for the Secret Betting Club and get started right away! P.s Don’t forget either that due to the unique way the Secret Betting Club is funded by their members, all of their tipster reviews and reports are 100% independent, so when they say something is good, it genuinely is! I’m a bit late posting this but I do like the Secret Betting Club. I have worked with them and for them over the past couple of years and they really stand out. This post explains a bit about them in the form of an interview. So, just what is The Secret Betting Club? Well the Secret Betting Club (or SBC as most members refer to us) is an independent reporter on what makes money betting, designed for the ordinary punter. Primarily our role is reviewing and ranking tipster services, which we do each month through constant proofing and reports that we provide to our members. Recently our remit has also expanded into other areas such as choosing the right bookmakers, interviews with professional gamblers and topics like the best mobile phones and tablets for betting. As everything we do is independent, we are one of the few outlets that is actually on the side of the punter and not the bookmaker. What is your background and how long have you been running it? Well for as long as I care to remember I have been betting and for most of the last decade I have been making money in doing so. There is a small team of us working at SBC and all of us are dedicated bettors, with plenty of success behind us so we don’t just report on it, we actually do it ourselves. SBC was originally set up back in May 2006 so we have been there bought the t-shirt when it comes to understanding the tipping world! If someone was to sign up today, what can they expect straight away? Well there is plenty to sink your teeth into straight away. You can dive into reading our entire back catalogue of past tipster reviews (during our 7+ years we have checked out literally hundreds of services) or read our betting expertise articles and pro gambler interviews. We also have a number of profitable and ready-made systems for you to use and follow for free, with 1 each for football, racing and golf. All 3 of these have a proven history of betting success, having made a long-term profit for a number of years. For those looking for the best possible grounding in how to make money betting, we also supply our 100+ page ‘Pro Gambler Blueprint’ for free to all new members. Its full of advice from professional gamblers on the foundations required for success and the pitfalls to avoid. We give a heck of a lot away with our service to our members as we want to give you as much as help as possible to make your betting a success. That is our number one priority! What is the Secret Betting Club forum like? Is it a busy one? Everyone who joins SBC gets free access to our forum and so it does get quite busy. There are different sections to the forum, specifically designed to help you get what you want out of it. We also have a thriving free tips area where you can find a number of long-running and profitable betting threads and systems that are updated daily. Some of these are from actual SBC members with others supplied by commercial services sharing their advice for free. I have been very impressed with the SBC Magazines. Which big name gambling professionals have you had the pleasure of interviewing? Any you particularly recommend reading? We have spoken with plenty of big names during our time, with the likes of the award winning betting writer Ed Hawkins (Betfair’s cricket tipster) and a recent interview with top racing tipster Laurence Lambourn just two I particularly enjoyed. Sometimes it isn’t always the big names that reveal the most however as many of the best known people in this industry are full of hot air. They might talk a lot about betting, but wouldn’t know how to turn a profit from if it bit them on the backside! That’s why some of our ‘lesser known’ interviews have gone down so well with a recent chat with a pro punter who is making 20k to 30k a year betting on tipsters particularly fascinating. Sometimes our interview subjects wish to remain anonymous, such as our chat with an ex-bookmaker who was happy to spill the beans on what REALLY goes on behind the scenes. Are the back issues available to new members? Yep, all of them are available to download to all new members. In your experience, how hard is it to find profitable tipsters and what are the usual profits that these tipsters produce? It is hard to find profitable tipsters if you are a lone voice in the wilderness – something I hear time and again from SBC members after they join us. There are good ones out there (indeed we have over 20 in our Hall of Fame) but it’s taken us more than 7 years to find the truth on them and to track their records accurately. Its not just profit levels that matter though as once you have found a winning tipster there is so much more to observe. How easy are their claimed odds to achieve for example? If you can’t match them, then you are done for – and this is the type of analysis we get stuck into. The practical consequences of following any tipster is very important to us. The profit levels vary and we often like to judge them on a couple of key calculations – Return on Investment (ROI) and Return on Capital (ROC) . These are two useful figures as it tells you how much you have to risk to make a profit (ROI) and the size of your betting bank growth (ROC). The very best tipsters often have a ROI of around 30% (so for every £100 you stake, you win £30 on average) and a ROC of perhaps 200% per year (basically doubling your betting bank once a year). Some of our members bet full-time and make enough from it to live that way, whilst others are happy to do it part-time and build it up from there. How much does it cost to become a member and how long does the subscription last? It costs £79 for a year’s membership to the service. This grants you access to not only the next 12 months content but also our entire back catalogue, plus free systems, forum and more besides. Importantly it also enables us to be fully independent so you can be assured what we state is always accurate. We also offer a full money back guarantee if you join us and don’t like what we offer (no questions asked) so you can effectively join us risk-free.